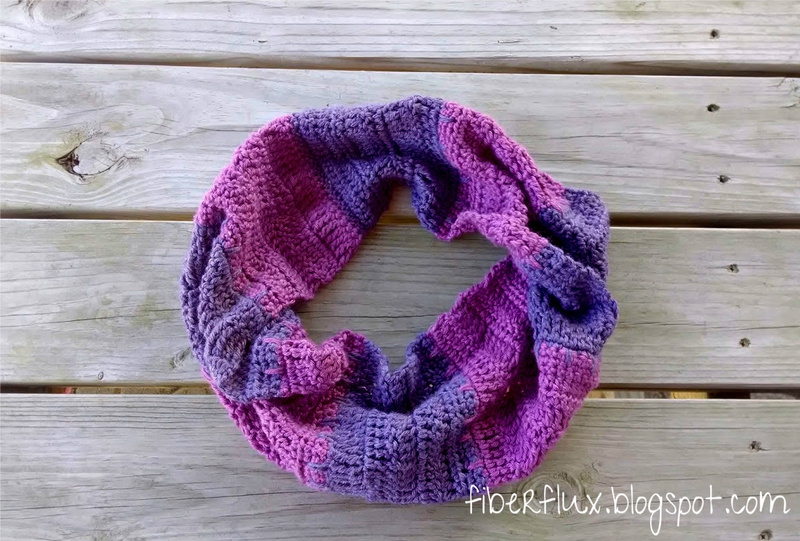 The Violet Tones Infinity Scarf is super soft with lots of drape. It is truly a sampler-type project because it uses lots of different basic stitches. This makes for a fun and engaging project that is perfect for both newer crocheters to learn and practice and for seasoned crocheters who are after something simple and engaging. The Violet Tones Infinity Scarf, with its sampling of stitches, was inspired by our summer CAL, the Crochet Class Cowl pattern. Note: The Caron Simply Soft Eco contains white "flecks" that are actually recycled plastic bottles (pretty neat!). You can kind of see them in the photo above...they have a slight tweed-like effect. If you're into a more solid color appearance, try the regular Caron Simply Soft. Foundation Row: In second ch from hook, work a sc. Work a sc in each ch to end of row. Row 1: Ch 4 and turn. Work a tr in first st and in each st to end of row. Row 3: Ch 3 and turn. Work a dc in first st and in each st to end of row. Row 5: Ch 2 and turn. Work a hdc in first st and in each st to end of row. Row 6: Repeat row 5. Row 7: Ch 1 and turn. Work a sc in first st and in each st to end of row. Row 8: Repeat row 7. Row 9 (Change colors before beginning this row): Ch 1 and turn. In the first st, work a sc. In the next st, work a sc. In the next st, work a "spike" by inserting the hook a few rows down and then work a sc stitch as you normally would. Keep following this sequence (sc, sc, spike) until you reach the end of the row. Repeat rows 1-9 until desired length is reached, ending on row 8. Weave in any ends and seam the ends of the scarf together. You can sew it with a tapestry needle and some matching yarn or slip stitch it together. look at those violet tones sing! Very pretty. I enjoyed doing the summer CAL. Thanks and so glad you joined us for the CAL! Making this now, but I am using 3 colors instead of 2! Sounds pretty! I'd love to see it...definitely share it on Ravelry or Facebook when you finish it! This scarf is so beautiful! I plan on making my aunt one for Christmas! Love this scarf! Quick question if I only wanted to do one color would I simply omit step 9 and continuously repeat steps 1-8 until desired length is required? If I link back to you, may I sell the finished product? Can I purchase one of these? My wife just finished a successful battle with breast cancer and would absolutely love this scarf. Her favorite color is purple. Hi, Jennifer. 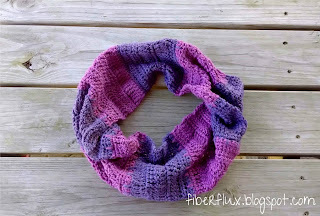 This is a gorgeous cowl and as usual, I have saved it to use for a gift. Love the Knook!